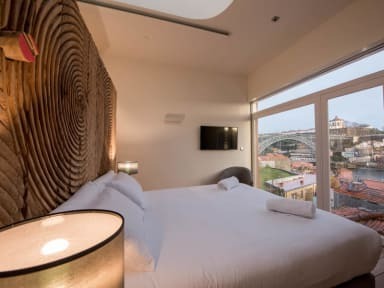 Bluesock Hostels Porto is located in Ribeira, the historical centre of Porto, on the banks of the Duero River and just steps from the city’s main attractions. From the hostel you can walk to Praça da Ribeira, Palácio da Bolsa, Alfandega Congress Centre and many other places you won’t want to miss. We are also surrounded by loads of restaurants, terraces, shops, cafés and wineries to lose yourself in. A traditional blue-tiled building that blends into the heart of Ribeira. 3,000 square meters. A basement with spectacular arches, the ground floor and six additional floors. These are the dimensions we hope to fill with Bluesock experiences. Bluesock Hostels Porto is located on Rua Sao Joao, 40, just a 10-minute walk from São Bento station. And, although this is a city to discover on foot, we have public transport and the main roads on our doorstep. The price of the breakfast is 4 € per person, breakfast in private rooms is included. The LOCATION was the BEST part! You are right on the Ribeira! You walk out of the hostel and turn left and are 100M from the Douro River. The lobby is very modern. Hotel-like cars access to your room. The bunks are spacious with a privacy curtain, 2 outlets, and a light! Lockers are underneath the bottom bunk! Showers are push-button to conserve water; meaning one push last about 20-25 seconds. Not the end of the world! Again, the LOCATION for the PRICE is the key seller here! It was such a perfect and comfotable hostel!!!! And big thanks to Anrdè for making everything so perfect! Would go back 100%. Perfect location and spotless clean. 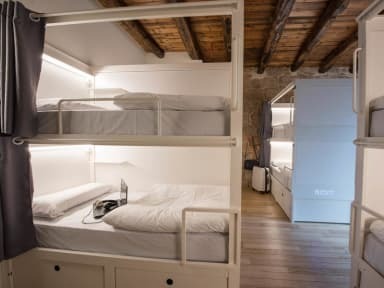 Amazing hostel! The rooms were nice and private, bathrooms, and common area were all really clean and smell good. Staff were nice and accommodating. The bar area was nice, good food and drinks, and was a great place to meet other travelers. This place is centrally located and close to everything. Great hostel, the bar was closed the whole time so no one socialising. Good location, super friendly helpful staff, room was clean and comfortable, washroom was out of toilet paper and paper towel a couple of times which was the only neagtive. I stayed in a four bed mixed dorm and would go for a larger room next time not worth the extra $$. It was a quiet atmosphere with a wide range of ages staying at it. Would recommend to family and friends! Big spacious rooms which can make it a very private place if you want it to be. Female and male bathrooms in each room is also a plus. Common room areas are nice but not lively so it was hard to meet people. It's an easy walk from the metro to get there and the location is an excellent one by the river. Big new shiny hostel. But soulless, and apparently designed by someone who had never stayed at a hostel. Many places where they chose appearance over function. Like the showers. Fine clean lines, but no hooks for clothes on the door. One hook on the wall, but in range of the shower head. I guess adding a couple of hooks to the door would wreck the image. Not for me, but no doubt some people like it, which may be you. I won't be back.